Johns Hopkins Medical School in Baltimore, Md., will host the play "Marginalia," written by Hot Springs physician and playwright Dr. Richard Pellegrino, as part of the "Art of Medicine" project at 6 p.m. April 6. The centerpiece of the event is a staged reading of "Marginalia," followed by a Q&A conducted by Pellegrino and including JHMI faculty and actors from the play. The project adresses the fact that medicine has both a scientific and a human side. Diagnosing a disease properly is of paramount importance and requires keen analytical skills, a news release said. Discussing these issues with patients and understanding the effect on their lives is an art and requires an understanding of the human condition. Pellegrino wrote a series of poems about his experiences with patients while he was a medical resident in the 1980s. He saved them and Incorporated these and other experiences into "Marginalia." "Marginalia" is about a prominent physician who finds himself haunted by the memories of former patients whom he feels he let down. His unease becomes acute when he develops a serious illness. He is compelled to face these difficult memories head on and be held accountable for his actions. Ultimately, it is these very patients that help him understand the power of hope, and rediscover the emotions and ideals that called him to medicine in the first place. The play has been produced at the Wildwood Park for the Arts Theater in Little Rock, and offers many opportunities to explore important issues regarding the doctor-patient relationship. It will be produced as a showcase in New York City before going to Baltimore. Pellegrino's other works include "Taking Back the Future," a documentary on the patient experience with multiple sclerosis, which premiered at the Hot Springs Documentary Film Festival; "I Love You Not," an original play that also premiered in Hot Springs; and "Point Source," a medical thriller about a mysterious outbreak of multiple sclerosis in rural Arkansas. Johns Hopkins has pioneered the concept of using art as a teaching tool in medicine for more than 110 years through its Department of Art as Applied to Medicine. The department focuses mainly on the visual arts. The "Art of Medicine" project seeks to extend this concept to the theatrical arts, using the power of story to start conversations about the human side of medicine. "Baltimore medical school to host play by local physician." The Sentinel Record [Hot Springs, AR] 11 Mar 2016: Entertainment. Print. "Alumni Notes." Yale School of Drama [New Haven, CT] 2013-2014: 76. Print. I love reading thrilling novels packed with international intrigue, suspense, action, conundrums, arrogance, murder, ambition, character development, independence, subliminal messages and contemporary political history. In Point Source by Dr. Richard G. Pellegrino, readers are treated to a unique medical thriller with the qualities that I love in a novel. Readers are swiftly carried from day-to-day and event-to-event over three months in the lives of people who accidentally stumble unto an international terrorist plot by North Korea’s Kim Il Sung, one of President George W. Bush’s three Axis of Evil leaders, to assassinate South Korean statesman and candidate for the presidency of South Korea Bo Li Yeung. The weapon of choice is a biological weapon of mass destruction. The author has two missions in the novel. One is to awaken the readers to the symptoms and the daily physical and mental challenges accompanying MS, and to illustrate the courage it takes to adapt to the progressive limitations of the disease. The second mission is to entertain the reader with a who-done-it mystery that operates on several levels. He succeeds with both missions. Unlike any other book I have read that covers MS, Point Source provides personal insights into the disease, and celebrates the courage; struggles, determination, and sense of humor people require to deal with it. The characters with MS are convincingly human, and when I finished the book I did not have the impression that MS individuals are supermen and women performing Herculean feats. Instead, I learned that MS affects 2.5 million people worldwide. Through the sometimes contentious relationship between Dr. Angela Donatelli and her mother Marie, who has MS, the reader discovers that this progressive disorder of the nervous system is far from well understood. The deterioration of motor control is a central symptom of the disease, but there is a mental dimension as well; one that affects a patient's cognitive functions, from memory to the ability to complete complex tasks. Not everyone with MS experiences such cognitive impairment, and for those who do, the effects are usually very subtle. While I know there is no cure for MS, I learned the cause of MS is equally unknown. The book educates the reader on the evolving struggles that people with MS face daily. It exposes the imperative of finding a cure. Knowing what I do about the promise of stem cell research, then I believe stem cell research should be funded, not only because it might help with finding a cure for MS, but also for its potential in curing or alleviating a host of other immune-system and degenerative diseases. The book also shows the hope that people with MS have in the medical profession’s efforts to discover, treat and eventually cure the disease. Dr. Pellegrino is one of the country’s top neurologists, and he specializes in working with MS patients. In this medical thriller he shows his intimate knowledge of the disease by imagining the onset of neurological disease among an extraordinary number of patients who are developing MS symptoms in Hammerstone, Arkansas. His understanding of the psychological and physical effects of MS is expressed primarily through Linda Tackett and Marie Donatelli. Both llive with MS, and both want to remain independent, as long as they can, before their disease debilitates them. They exemplify the way that MS individuals draw strength and support from their families and friends to deal with the effects of the disease, and the personal bond between these two women clearly illustrates the benefits of such support. Linda and Marie are invigorated by assisting Angela in discovering the cause of this seemingly inexplicable mass outbreak of MS symptoms. Angela, one of the book's two principal characters, is a neurologist like the author, and her experience in dealing with MS certainly comes from Dr. Pellegrino’s. In reading about Linda and Marie's daily struggles with MS, I found myself rooting for their courage and praising their independence. Angela’s coming to terms with her mother’s MS is one of the underlying themes of the book, and Dr. Pellegrino does an excellent job in showing how their relationship is strengthened through communication, education, and love, as well as by Angela’s personal realization that Marie fiercely defends her independence for the sake of her own psychological benefit. In the back of this book are letters to Dr. Pellegrino from people with MS expressing their eelings about the disease. Having worked with people with MS, the writer poignantly conveys the hopes and fears in Point Source’s characters. The book’s characters and letters reveal true profiles in courage. I was entertained by the book’s characters and plot. Linda and Marie introduce Angela to the prospects that an extraordinary epidemic of MS may be sweeping through Hammerstone. Persuaded by Linda and Marie to solve this puzzle, Angela is medically challenged to discover how so many people, all from the same small community, could suddenly begin showing MS symptoms. We learn that the medical emergency was caused when Luke Yancy unsuspectingly opens a Pandora’s Box he should not have touched. Intellectual innocence can cause disasters, and though a man, Luke has the innocent intelligence of a child unable to realize the consequences of his disastrous curiosity. The humanitarian in Angela compels her to find the mysterious causes of these symptoms. This takes her to Hammerstone, where the mystery expands to include the murder of a former medical colleague, Jack Burns, whose thirst for fame has led him to develop a new and horrible biochemical weapon. Burns’ death produces a plethora of questions for Angela. Does his death have anything to do with the tidal wave of people developing MS symptoms? What is it that is causing the outbreak of these symptoms? Are these symptoms temporary or permanent? Can the causes of MS finally be explained? The megalomaniacal Burns was once a viral researcher and a former colleague of Angela’s, who had loved titillating her by developing computer riddles for her to solve. Before his death, he had e-mailed her a riddle that, once solved, explains his work and his crime. Now Angela faces a life and death challenge to solve the riddle, entering his program, and discover the secrets hidden therein. Unlocking the riddle is the challenge of a lifetime for Angela, who realizes that if she fails many others will die. To find a solution to the task before her, she enlists the help of the Hank McLain, Hammerstone's chief of police, and calls in the Center for Disease Control in Atlanta. In Hammerstone, Police Chief McLain enters not just the mystery but Angela’s life as well. Motivated by the death of his brother Mark, who died fighting the fire that killed Burns, career officer McLain is obsessed with finding out who is responsible for his brother’s death. He is a detective’s detective, and he persistently searches for clues and assistance in both Hammerstone and Little Rock. You know that, through sheer grit, his analytical powers, and his willingness to accept help in solving his brother’s murder that he will ultimately triumph. As a character, Hank seems more appropriately suited for big-city detective work, rather than sidelined in a small town like Hammerstone. In future novels, I would like to see him working in a big city. Hank meets Angela at the ruins of Burns’ house and, after some joshing, they become friends. Bonded by common pursuits, these two self-determined individuals develop a strong relationship that one concludes will eventually consummate in romance. Still, while the relationship blossoms, the two stay focused on their quests to learn the causes of both the disease outbreak and the violent death of Burns. The book brings out the close-knit relationships that people in small communities where everyone knows everyone. For instance, when forced to send his deputy Thelma Wilkins out to warn local residents to watch what they eat and drink, the names Jennifer, Merle, Stedmans, and Jimmy McMasters roll off Hanks lips as easy as breathing. You know he is their protector, savior, and friend. Point Source also brings out the scarcity of resources that small towns have and the need to send crime scene evidence to larger cities for testing. One of the strengths of this book is the single-minded focus that both protagonists bring to discovering answers to their questions. Angela and Hank won’t be stopped by any authority, including the federal government, as they try to solve their cases. Their focus is aggravated by FBI Special Agent John Holmes, an arrogant, self-centered Darth Vader carrying a badge. Holmes is determined to establish a possibly criminal relationship between Jack Burns and Angela, although the facts do not support the charge. His “I am above reproach attitude” shows why a post-Patriot Act America must curb the powers of ambitious police who think they are above the rule of law. In his pursuit of Angela to discover what she is working on he says, “These are federal search warrants and a subpoena for her medical files. We’re going in hard, we’re going in fast, and we’re going to find out just what our little local doctor has to tell us.” Later, at Angela’s house to discover potentially damming information against her, Holmes’ Gestapo style is useless in the face of Marie's charm and hospitality when she uses both to defuse a potentially explosive situation. Dealing with MS daily requires creativity and a sense of humor, and this situation shows how Marie has developed both. Holmes's behavior spurs Angela and Hank to solve their mysteries. In the course of their investigation, they succeed in humbling the arrogant FBI agent at several key moments, and I cheered each time. He reminds me of J. Edgar Hoover, a pompous idiot, who was more egotist than policeman. In a further touch of realism, Dr. Pellegrino adds intrigue to the plot by having his North Korean conspirators pose as Chinese. This is a subterfuge that North Koreans have used in recent years with some success. It is not uncommon for North Korean agents to assume Japanese and Chinese identities when spying undercover. Pellegrino says he intentionally used this ploy to call attention to this insidious policy. Point Source brings home the reality that a biochemical-terrorist attack can strike any time and any place, and that fanatics don’t care about their lives and the people they kill, whether individually or in mass. The book tells us that biochemical weapons are deadly and readily available to the highest bidder. I believe the author is telling us subliminally that the country needs to be vigilant in our war on terror. Point Source a classic story of good triumphing over evil, both medically and judicially. Angela and Hank are confident, thoughtful, courageous professionals, with a strong understanding of right and wrong, and who utilize their backgrounds in a climatic way to prevent an international incident involving bio-chemical weapons in Little Rock. The book does not mention whether their government honors them for their heroism. However, we know that Angela is honored by the people whose lives she saves. And Hank? What is his reward? Read the book for an answer. Angela and Hank are stoic anti-heroes who have other adventures in front of them. I look forward to reading more of them. Point Source is Dr. Pellegrino’s first novel, and I hope it is not his last. John M. Williams. "Point Source Rivets the Readers." Review of Point Source by Dr. Richard G. Pelelgrino. 23 December 2004. Hot Springs doctor give media the treatment. Dr. Richard Pellegrino of Hot Springs has a big personality, and he’s using it to achieve a big goal. The energetic, funny and outgoing neurologist has put his medical mind to work on movie making and mystery writing, all for the cause of promoting an understanding of multiple sclerosis. Pellegrino’s film, “Taking Back the Future: Living With MS,” drew 700 people when it was shown at the Hot Springs Documentary Film Festival this fall and earned a review in the Oct. 9 issue of The Lancet, the British medical journal. He’ll show the film and give a talk at 6 p.m. Friday, Nov. 19, at the University of Arkansas for Medical Sciences. The documentary and the thriller, “Point Source,” whose heroine is a Hot Springs neurologist with an Italian name and lots of MS patients, were conceived two years ago by Pellegrino, who wanted to create a “media voice” for MS patients. The documentary is not a “motivational film,” Pellegrino said, nor is it a film about heroic achievements of people with MS. Instead, it’s about what living with MS is like — information that families and friends need but often don’t get. “Taking Back the Future” features profiles of several of Pellegrino’s patients, as well as a role for the doctor himself. The profiles can be uplifting: A horsewoman continues to ride on a specially made saddle though her disease is making it increasingly difficult for her to walk; a young man who must leave his wheelchair to flee a sinking boat decides to get therapy to become ambulatory again. There are those not so uplifting: A Navy veteran can no longer bathe himself and is depressed about it. A young welder can no longer work because heat triggers his episodes. A young MS sufferer is left by her husband, who then seeks custody of the kids. Punctuating the patient segments are scripted scenes of Pellegrino and Dr. Jack Burks of the MS Association of America and a fictional teacher, Ms. D’Eramo, who has just been diagnosed and is fretting about what lies ahead for her. Pellegrino and Burks talk about patient cases over a Southern Italian meal at Belle Arti, the well-known gourmet restaurant in downtown Hot Springs. (The documentary has quite an Italian flair; Joe Pesci, Frankie Valli and Frankie Avalon read the letters from MS patients that are included at the end of the film. When this is raised with Pellegrino, the doctor laughs and says, “Yeah, and if you don’t like it I’m going to send Bruno out after you.”) The staged segments are a device to offer facts, in a conversational manner, about how MS is diagnosed, advances in medication during the past two decades, what financial and emotional difficulties may arise. Movies don’t do it for everyone, of course. Su Jolley, a patient of Pellegrino’s from North Little Rock, said the neurologist called her at 10 p.m. one night to tell her he wanted to make a documentary and ask what she thought. “I said it sounds boring to me,” Jolley said. But “Point Source” was different. “I couldn’t put it down.” Jolley has worked with Pellegrino since that call, asking MS patients to write about their lives and how they’d solved problems on Pellegrino’s website, www.yourmovieproject.com. Pellegrino said he took his “cues” from MS sufferers in the creation of the film and the book. Pellegrino’s alter ego — Angela Donatelli, a Hot Springs neurologist who treats a large number of MS patients — is the heroine of “Point Source,” which revolves around an epidemic of MS in a small town in the Ouachitas. There’s a love interest, a wise mentor, feisty older women who lead bullies from the FBI astray, Korean terrorists and, of course, facts about multiple sclerosis sprinkled throughout. The book is well crafted and suspenseful, even if the characters occasionally drift into cliches (they do a lot of “soft chuckling”). Pellegrino credits editor Nancy Gratton for the book’s flow. Jolley, supportive of the book project even when friends with MS told her they couldn’t see anything “thrilling” about the disease, knows there’s a need to inform the public about MS. “Eight times out of 10, when I tell someone I have MS, they say, ‘I’m so sorry.’ I could just whack them … I don’t need to hear that,” Jolley said. She believes in fighting all the way, by staying active and positive. MS’ “silent symptoms” — excruciating muscle cramps and debilitating fatigue — can make its victims look like slackers to those who don’t understand the disease process. “I have a friend who’s a doctor,” Pellegrino said. “I’m in a party with him at his house and he’s talking to me and he says, ‘Excuse me a second, but I have to hit the floor.’ ” He meant it literally; the drain of MS is profound. “It made an impression on me,” Pellegrino said. A Bronx-born physician with degrees from Albert Einstein and Columbia universities in New York, Pellegrino runs a research center at St. Joseph’s Mercy Hospital, where he runs clinical trials on drugs. He wants his self-published book and film to undergo double-blind trials, too, as if they were medicines. He and Dr. Michael Cody of the Annenberg School of Communication at the University of Southern California are putting together a test that will send the book and film to 26 sites around the country; the test will compare patient-family reaction to the book as compared with informational handouts. He’s also hoping to work with Chuck Anderson, a professor of rhetoric and writing at the University of Arkansas at Little Rock who’s interested in what’s called “narrative medicine” — the theory that the way people structure their stories when they talk about their illnesses has particular meaning. Pellegrino would offer the hundreds of letters he’s received from MS patients to Anderson for his analysis. Pellegrino’s interest, he said, is not so much in teaching the science of MS, whose cause remains unknown, as in addressing the “human side of the illness.” “Point Source” will have a sequel, Pellegrino said, about a man (named Dante, from Italy) who perverts clinical trials for his own ends. While thrilling the reader, it should also impart some information about ethics and human drug testing. Cancer patients will be asked to write Pellegrino, as MS patients were. Jolley has one complaint about “Point Source.” “The girl didn’t get the sheriff,” she said. Perhaps successive “Dr. Donatelli” thrillers will. Pellegrino’s talk and film Friday will be presented in the Sam Walton Auditorium on the 10th floor of the Arkansas Cancer Research Center. Oransky, Ivan. "From narratives of illness to "edutainment"." Lancet. 9 October 2004: 1305-1306. Print. When the lights go down at the Malco Theatre for the premiere screening of Taking Back the Future: Voices of MS, it will signal the culmination of an extraordinary project for Richard Pellegrino, M.D., Ph. D. But the showing of this film at the Hot Springs Documentary Film Festival is only the beginning, and only a part of a much larger mission. "This documentary has work to do, and we're going to put it to work," Dr. Pellegrino explained in a recent interview. As the President of a Hot Springs clinical research center, multiple sclerosis clinic and an inpatient physical rehabilitation program for people with MS, Dr. Pellegrino became acutely aware of the need to educate the public on the challenges of those diagnosed with chronic incurable diseases. Several years ago he hit on the unusual idea of using various art forms as pathways to promote understanding. "Stories have been used for centuries as a vehicle for teaching. And if the story's good enough, we may even enjoy the teaching," he says. TO allow people a media voice addressing the disease and its conditions, Dr. Pellegrino opened a website, YourMovieProject.com, several years ago. Hundreds of MS patients from all fifty states and six countries responded, writing narratives about their experiences. Whereas Pellegrino had previously been limited to his scientific knowledge of the disease, the website allowed him to "get inside the heads" of the people who actually lived with MS. "The letters provided much insight that was useful for my documentary, but that's not all. They inspired me to try my hand at a novel..."
The documentary films works in tandem with MS: Behind the Scenes, a live show, and Point Source, a fictional medical thriller already in print. Directed by Ken Mandel, Taking Back the Future: Voices of MS centers around eight of these patients in different stages of MS and uses a fictional character, Margaret, to pull these stories together. Well-known celebrities such as Joe Pesci, Ed Marinaro, Dennis Farina, James Darren, Helen Gurley Brown, Frankie Avalon, Jacklyn Zeman and Tom Dressen are featured reading actual letters submitted by MS patients to the website, but the real "stars" of the film are the patients themselves, whose everyday lives are affected. "In Hot Springs, MS stands for Movie Star," Dr. Pellegrino tells his patients. Hot Springs is a key factor in many aspects of this project. 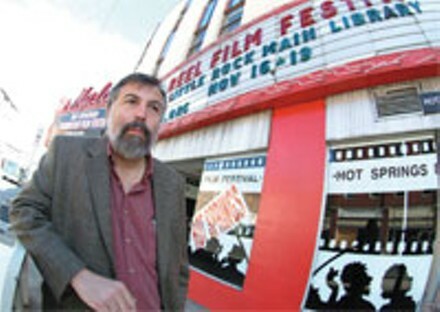 The Documentary Film Institute was instrumental in the production of the film, namely in matching the producer and director. This area is also the location for the book. The protagonist, Dr. Angela Donatelli runs a MS clinic and research center in Hot Springs. When an unusual outbreak of the disease breaks out in the fictional town of Hammerstone, twenty miles away, Dr. Donatelli enlists the help of her MS patients in unraveling the mystery. They all become embroiled in the intrigue of an international conspiracy as the plot unfolds. Wilkins, who has been an entertainer for over 20 years, warms the crowd up with music and family-oriented laugher, then Pellegrino talks to the audience about the disease in an informative manner. Designed to draw two audiences, MS patients and their families plus the arts community, the show concludes with the powerful document. Pellegrino is working with the Multiple Sclerosis Association to draw audiences across the country. Presentations, with no admission charge, are planned for cities in Arkansas, Tennessee, Texas, and Mississippi in the coming months. "Art on a Mission for MS". The Springs Magazine. October 2004: 5. Print. Gregory, Mark. 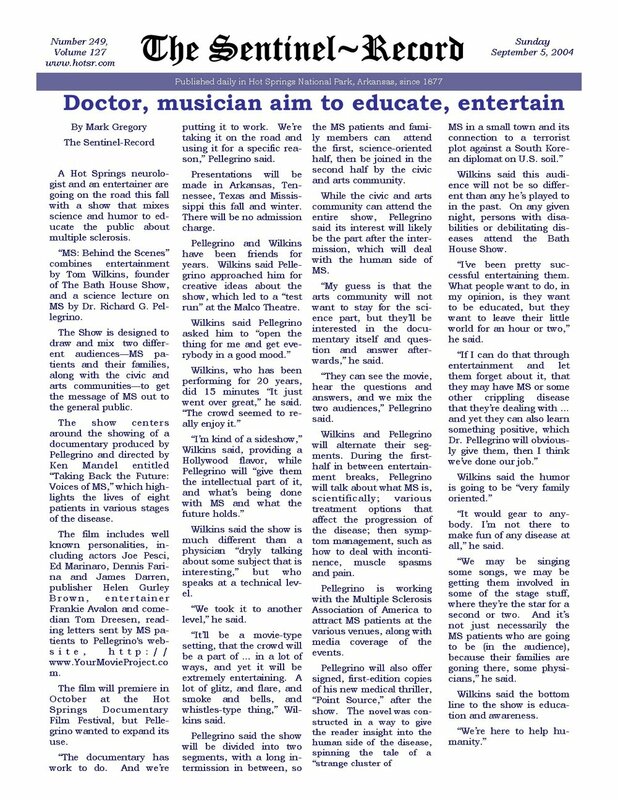 "Doctor, musician aim to educate, entertain." The Sentinel Record [Hot Springs, AR] 5 September 2004: Print. A 15-year-old girl in Massachusetts sits down to write a letter to a doctor in Arkansas whom she has never met but feels an immediate connection. “I am an actress and my mother has progressive multiple sclerosis, “ she begins. An article in “The Motivator,” the magazine of the Multiple Sclerosis Association of America, describes Dr. Richard Pellegrino’s film project and invites people with MS to help him develop the script. In Newbury, Robin Moulton, 45, who has had MS since she was 25, spots the write up and shows it to her oldest daughter, Rebecca. The next day, the high school sophomore sends off her letter. Pellegrino came to the Boston area recently to stir up interest in his project. It was his first stop on a national tour, and at the Thayer Public Library in Braintree, a dozen people touched a lot of bases in less than two hours. Rebecca was the youngest one there, but she connected with people two and three times her age. The different generations shared and learned from each other. “Life experiences can bring out a maturity in young people,” Rebecca’s mother , Robin said later. In her letter, which Pellegrino described as extraordinary, Rebecca condensed years of emotional struggle, daily responsibilities and triumphs. She described how until she was 9, her mother could do almost anything—ski, skate, play tennis. Then things went bad. Her mother began falling. “There were lots of trips to the doctor, more pill bottles in the pill basket.” Her mother needed a leg brace, then a cane, and eventually a wheelchair. The worst thing was when her father left. There were now financial pressures as well. Rebecca’s chores increased; sometimes she felt resentment,; she and her mom argued. But she also realized that her mom was trying hardest to give her and her younger sister a normal life. Rebecca wrote; “Through all the pain and difficult times she goes through, she always seems to pull through for us. It’s been one rough trip, but somewhere in the middle we grew closer to each other. It’s true I wish my mom didn’t have MS and that she was like my friends’ mothers, but I can’t change anything, only help to make it better. My mom is the best person in my life and I love her, MS and all. In his tour around the country, Pellegrino is looking for examples of how people meet the obstacles, overcome the frustrations. He found other rich material at the Braintree meeting. Jennifer Bayuk, 25, said that like Rebecca, she also grew up with the illness when her father , Tom, was diagnosed at age 42. She was 7. There were murmurs of recognition when Anita Anderson of Brockton gave a vivid example of the everyday predicaments people with MS must overcome. The day before the meeting , she said, she came out of her house in her motorized scooter to get into her van, which has special controls, to run an errand. She raised herself into the driver’s position and her leg got caught. She couldn’t slide into the driver’s position, couldn’t shut the door, couldn’t reach for the cell phone. She sat. And sat. Anita Anderson of Brockton has led an independent life despite having multiple sclerosis for 26 years. “One hour went by,” she said. “Then two. Then three.” She kept her composure, waiting, watching. Then she saw Larry, the mailman, coming down the street, and called out to him. He saw her helped her get free. Pellegrino listened to the story and found this message: “She didn’t conclude ’I’m totally helpless.’ I know people who have concluded that for a lot less. Scheible, Sue. "A GOOD AGE: Film Helps Motivate People with MS, their Families." The Patriot Ledger [Quincy, MA] 14 October 2002. Print. Caillouet, Linda. "Hot Springs doctor shares prestigious honor." Arkansas Democrat-Gazette [Little Rock] 15 Jan 1995: Print.